PRIVATE SURF LESSONS - Something for Everyone Wave goodbye to wipeouts. 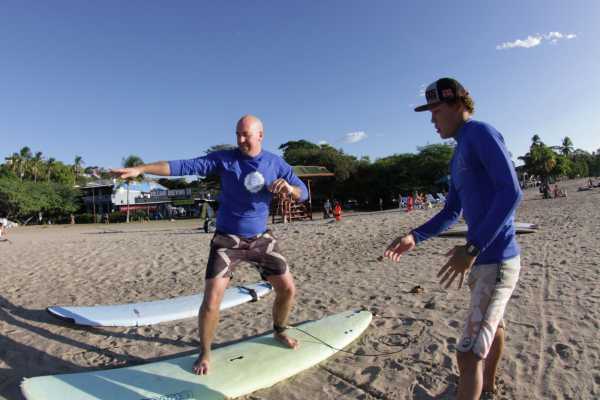 A private surf lesson is an investment in your safety that pays off in saved time and frustration. Learning one-on-one is the more traditional recommended approach to learning how to surf. We recommend a two-hour lesson. Included in the package is personal coaching, a surfboard and a rashguard. Approximately ninety percent of our students stand up on their first lesson! Plan for a morning; Afternoons can be windy. We’re available all year-round by appointment, and usually ready to go same-day. Appointment times are more flexible during the off-season, and often the conditions are better. Private surf lessons are for all ages. We require a private lesson for kids 8 and under. To make it more affordable, we offer a one-hour lesson if you prefer. We are well-versed in youth instruction from our summer camp programs, and cater to the abilities – or disabilities – of different surfers. Individual lessons are for all skill levels as well. The goal is to improve your surfing and have a great time. Whether you are a surf prodigy or have never seen the ocean before, you will walk away with valuable tips and techniques that you can use forever. First-timers get the full step by step treatment in our beginner-friendly waters at Tamarindo Beach, while more advanced surfers are taken to the ‘outside break’ where we can coach their wave-riding to the next level.